One Ticket provides one Admission for the Training Program. DESCRIPTION: An overall Training for Aspiring Baristas to Introduce the world of coffee from fundamentals and basic unto the advanced technique for both Espresso-based beverages and brewed coffee excellence. This program is a combination of the Barista 101 & 102 that does not require any prerequisite for registration. -Fundamentals of Free pour Latte art. -7 session Intensive training class w/ Guided Hands-on Training for Barista NC 2 Competencies with Industry standards. -Training Consumables (Coffee Beans, Milk, Syrups); competency allotted. register this APRIL and get at 15%off. VALID ONLY UNTIL APRIL 30,2019 FOR REGISTRATION. ENROLLED PAYMENTS MAY BE USED FROM APRIL -MAY SCHEDULES. 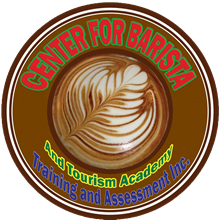 Center For Barista And Tourism Academy |Training And Assessment Inc.
founded on March of 2014, formerly known as CBHET (Center For Barista and Hospitality Education Training And Assessment) by Deejae A. Juanta a Well-respected, Well-known Barista Trainor and Assessor and Sen.Joel Villanueva’s Personal Barista Skills Trainor. Even before the Center was established, the Profession have been present with the employees and personnel themselves themselves including the Trainors, Assessors and Staff employees. Side-by-Side Center for Barista made history with TESDA through numerous times, and has empowered the Society with the KSA guideline for Knowledge, Skills and Attitude. Featured many times on various Social Bodies we will continue to spread the expertise we offer to the society. The Academy of Tourism aims to provide high-quality tourism and hospitality management education training to students who will be future professionals, entrepreneurs, managers, and technical experts in the industry. A premier institution of tourism and hospitality management education committed to the development of future mangers who will upgrade the tourism and hospitality management.